For the second time this month, Stanford heads to the East Coast for a two-game road trip. The first was marked by a pair of overtime victories against ranked teams. This one should be difficult as well for the No. 13 Cardinal, which plays at Cornell on Tuesday at No. 6 Notre Dame on Saturday in a rematch of last year’s NCAA first round contest. Notre Dame represents the highest ranked team on Stanford’s schedule this year. Stanford returned 11 starters and 96 percent of its goals from last year’s team that advanced to the second round of the NCAA tournament for the first time in school history. Stanford opened with two home victories before failing to protect a five-goal lead in a 16-15 overtime loss to Vanderbilt. However, Stanford has since won four straight, including a pair of road overtime victories over No. 11 Towson and No. 14 Georgetown. Tuesday’s Opponent, Cornell: The Big Red is 4-3 after winning four of its first five and then dropping its past two games. Cornell is coming off a 10-6 season in which the Big Red placed fourth in the Ivy League with a 4-3 record. Lindsay Toppe leads the team in goals with 22, and Emily Tripodi has 18 assists. The Stanford-Cornell Series: Cornell leads the all-time series, 6-2. This is their first meeting since 2008 when visiting Stanford lost, 13-9. All the previous meetings took place between 1999-2008. This will be the first in the series for Amy Bokker, who took over as Stanford’s coach in 2009. Cornell is 3-0 against the Cardinal in Ithaca, but Stanford has won two of the past three meetings. Saturday’s Opponent, Notre Dame: The Irish (8-3, 1-3 in the Atlantic Coast Conference) are led by freshman Cortney Fortunato, who has 28 goals and 10 assists. The team’s only losses are to teams ranked Nos. 1, 2, and 5 in the current IWLCA poll — all members of Notre Dame’s new conference, the ACC. Senior Margaret Smith leads the ACC in caused turnovers, with 2.00 per game. The Stanford-Notre Dame Series: Notre Dame leads the all-time series, 9-5. The teams met twice last year, including in the first round of the NCAA tournament in Evanston, Ill. Stanford won 8-7 on Hannah Farr’s free-position goal with four seconds left in frigid conditions. In the 2013 opener at Stanford, Notre Dame won 12-10. The teams have played four times in the past three years, with the teams splitting 2-2. Except for 2010, the teams have played annually since 2002. In games at Notre Dame, the Irish lead 3-2. Stanford most recent victory at Notre Dame was in 2005, by a 6-5 score. 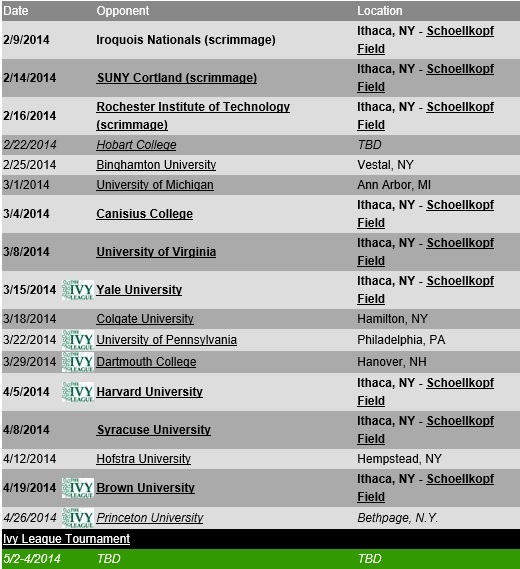 Cornell women’s lacrosse coach, Jenny Graap, has announced the team’s 2014 schedule; a challenging slate that includes six teams that advanced to the NCAA tournament last season, all of whom the Big Red will face in the second half of the season. Among those tournament teams are non-conference opponents Penn State, Stanford and Syracuse, as well as Ivy League foes Dartmouth, Penn and Princeton. Cornell opens the regular season at home on Feb. 23, playing host to Temple University – a new opponent for the Big Red – before hitting the road for games against familiar Ivy and Patriot League opponents in Harvard and Colgate. 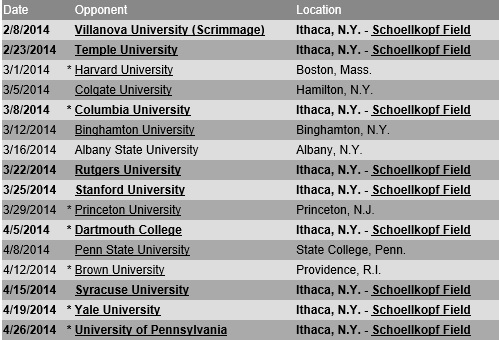 The Cornell Department of Athletics and Physical Education has announced the schedule for the upcoming 2014 men’s lacrosse season. The slate is an exciting one, highlighted by six home games – including contests against Virginia and Syracuse at Schoellkopf Field – as well as a road trip to first-time opponent Michigan. As always, the Big Red schedule will also feature the ever-competitive Ivy League conference games, several games with traditional rivals and the fifth season of the Ivy League Tournament. The Big Red will open the 2014 campaign in familiar territory, taking on Hobart at a site to be determined on Saturday, Feb. 22. The game will be the 134th meeting between the two programs, with the Big Red holding an 83-47-4 advantage in the all-time series, which began in 1896. After the Big Red dropped five consecutive meetings with Hobart from 1996-2000, Cornell has won 12 of the last 13 meetings. In his first season at the helm of the Statesmen’s program, Greg Raymond will lead Hobart in its first season as a member of the Northeast Conference. The Statesmen finished the 2013 campaign with a 6-8 record overall and a mark of 2-5 in the ECAC. Max Seibald, Rob Pannell, and Ryan Hurley talk Cornell lacrosse tradition and Jim Fenzel’s painting: “Red/White Scrimmage”. 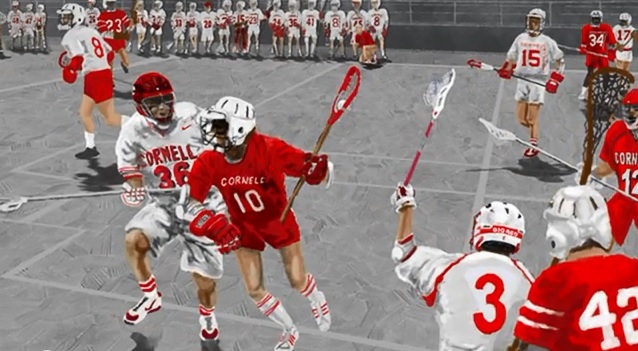 Cornell Men’s Lacrosse Red and White Scrimmage Tradition artwork by artist Jim Fenzel. http://www.JimFenzel.com. Cortland State University will host the first-ever meeting between the Iroquois Nationals and Israel, in a men’s lacrosse showdown as the two teams prepare for the FIL 2014 World Lacrosse Championships. 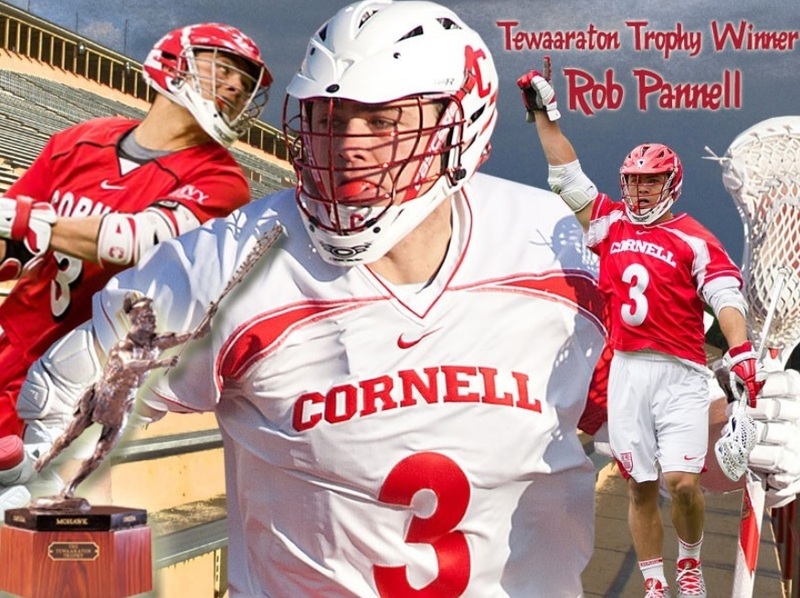 Rob Pannell has been named the winner of the 2013 Tewaaraton Trophy, the premier award in collegiate lacrosse, in a ceremony held this evening at the Smithsonian Institution’s National Museum of the American Indian in Washington, DC. He becomes the Big Red’s second recipient of the award, joining Max Seibald ’09, and Cornell is now one of four schools to boast multiple Tewaaraton Trophy winners (Duke, Syracuse, UVA). The award is the latest in a long list for Pannell, who was recently named the winner of the USILA Lt. Raymond J. Enners Award, for the Outstanding DI Player of the Year, as well as the Ivy League Player of the Year. He is the first-ever three-time Ivy League Player of the Year in men’s lacrosse and just the fourth player in the history of Division I college lacrosse to be named conference player of the year three times during their career. The all-time NCAA Division I career points leader (354), Pannell became one of just four Cornell players to earn All-American honors four times during their career when the teams were announced last week. A two-time Tewaaraton Trophy finalist, he has been named first-team All-American for the past three seasons, after earning a third-team selection as a freshman. Pannell is also just the third men’s lacrosse player in the history of the Ivy League to be named a four-time first-team All-Ivy selection. 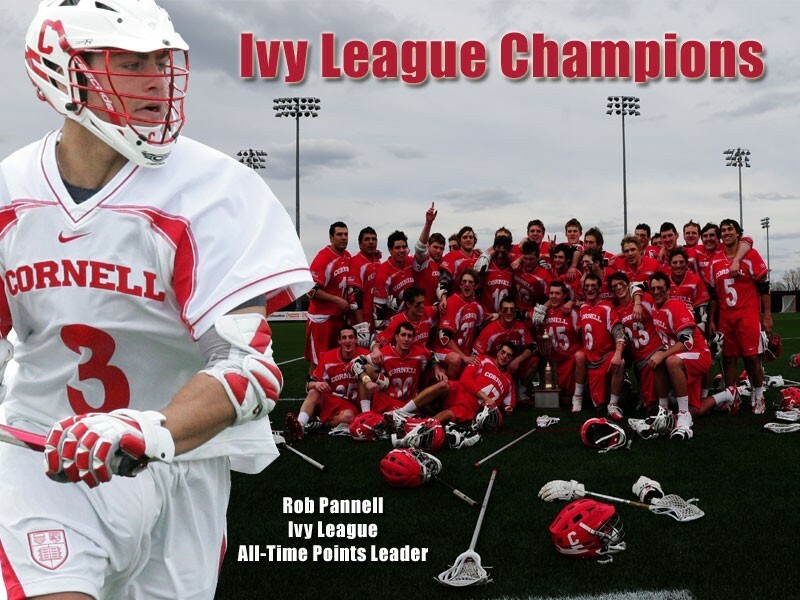 One of the greatest to ever play the game at Cornell, Pannell has proven to be one of the most consistent players in the country, having registered at least one point in all 72 games of his career. He capped his senior season by ranking third in the nation in points per game (5.67), third overall in assists per game (3.06), and 14th overall in goals per game (2.61). Pannell finished the 2013 campaign with 102 points, just three off the school record, set by Mike French in 1976. His 55 assists during the season are good for fourth overall in Cornell history, while his 47 goals rank 10th best in a single season. Exciting game that featured huge swings in momentum and some sick goals, won by Duke 16-14. RHS Productions.